Despite my misgivings after seeing some images of the Orion/Light Alliance Elves (ALL72004), I went ahead and ordered a set. The box art shows armored and helmeted elves reminiscent of the Peter Jackson Lord of the Rings films, but the figures in the box are quite different. 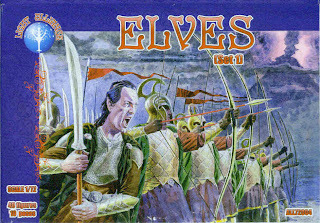 My first impression was that these elves were tall, with really long legs, but all bowed out as if they were the overgrown spawn of Svetlana Pankratova and Publius Quinctilius Varus. The set comes with four identical sprues of figures. They wear chainmail and leather armor, but unlike the box art they do not wear helmets. They stand about 28-30mm from the bottom of the foot to the top of the head, so scale out to about 7 feet tall. And while I said I liked my elves to be tall, these figures are just a little too much. If they had made them just 2mm shorter they probably would have looked more proportional, but as it is, I doubt I'll spend any money on Set 2 when it comes out. Below are the five melee poses. Next are five archer poses. Lastly, a comparison with Caesar elves. Useful review, thanks. Such a shame that they're so tall. They are tall fellows, aren't they. I'm glad at least they don't follow Peter Jackson's idea of armored elves. Their armor and helmets are just silly.